medical devices (including in vitro diagnostic medical devices). It defines a set of medical device risk management requirements. and monitor the effectiveness of risk control measures. applications for a product oriented approach to work effectively. development committee decided to prepare ISO 14971.
must be used throughout the product’s entire existence. However, this standard does not apply to clinical decision making. regulated by this international standard. medical device manufacturers to use this standard to manage risk. 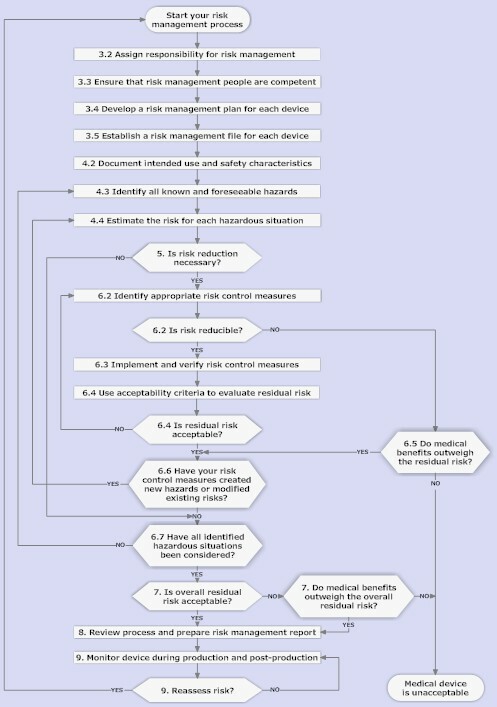 as the official standard for medical device risk management. demonstrate that this is in fact true). include BSI, Underwriters Laboratories, Intertek, and SGS. 3. Establish your risk management framework. 4. Perform a risk analysis for each medical device. 5. Evaluate risk for each identified hazardous situation. 6. Develop risk control measures when risk must be reduced. 7. Evaluate the overall residual risk posed by each device. 8. Review risk management process and prepare report. 9. Monitor device during production and post-production. The following flowchart summarizes this material in diagrammatic form. It highlights key decision points and lists the steps that should be taken.